When I saw white chocolate candy “melts” in the bulk bins of my local grocery store, I knew they would make great frog eyes. Make up a batch of cupcake for your next hoppin’ party. What You Need: 1 cupcake; green frosting; red string licorice; black string licorice (or just use writing icing); black or dark brown M&Ms; white chocolate melting disks. How to Make It: Frost cupcake green. Position lengths of red and black licorice as shown for mouse and nostrils. Use dab of icing to stick black M&Ms to white disks. Stick into cupcake for eyes. 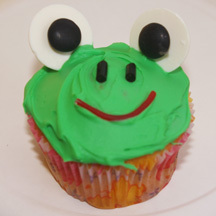 This entry was posted on Tuesday, May 17th, 2011 at 10:53 am	and is filed under animal cupcakes. You can follow any responses to this entry through the RSS 2.0 feed. Responses are currently closed, but you can trackback from your own site.